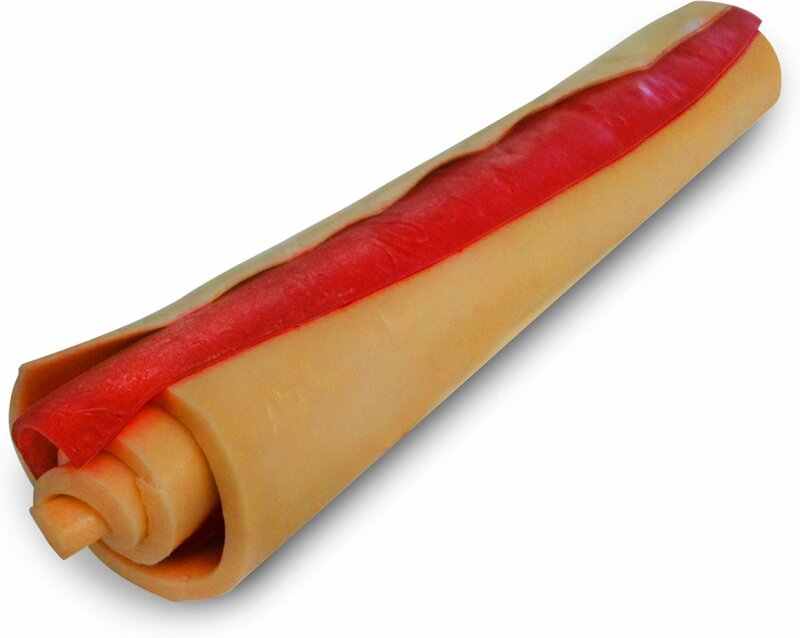 Many veterinarians are concerned with the potential health risks associated with dogs consuming rawhide. 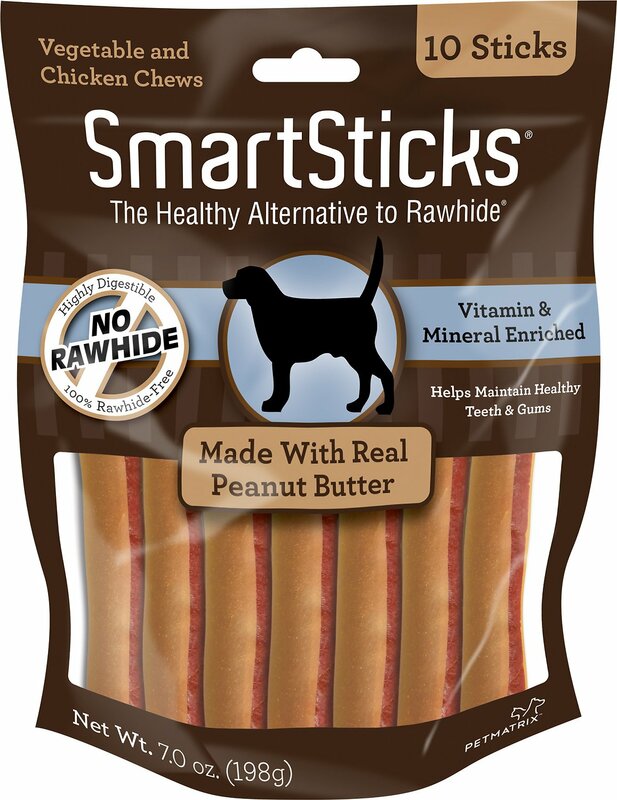 Rawhide-free SmartSticks chews made with real chicken, vegetables and other healthy ingredients dogs love provide your canine companion with needed chewing exercise and great taste. These chew treats are the healthier alternative to regular rawhide treats which may cause intestinal blockages. SmartBones are 99.2% digestible, which is higher than the digestibility of premium dog foods (85% digestibility). 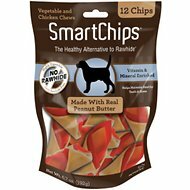 Smart chews for smart dogs! Our puppy loves them - the perfect special occasion treat! Our goldendoodle puppy is obsessed with these chews. And they smell really good. I much prefer the peanut butter scent to some of the meatier smells. He's 3 months old and it takes about 15 minutes for him to fully get through one of these, which makes them perfect for grooming or distracting him while I'm working around the house. I have a 10 pound chihuahua who is a picky eater and gets tummy troubles when she eats rawhide so these are a good substitute. They don't keep her or my maltipoo interested for quite as long as rawhide, but they still keep them busy for 5-10 minutes and that's usually enough to make them happy. Dogs love them but didn't last long. All four dogs just loved these chews. However, they weren't as long lasting as I had hoped but then nothing ever is in my household. They were done with them within 10 mins. I was hoping maybe 20-30 mins. My dogs range in size from 50 lbs to 25 lbs. I will still buy them again since they all really liked these & 10 mins is longer than any other treats! My Jack Russell absolutely loves these; however, my chi/dash mix wont touch them. 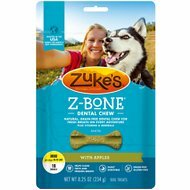 They are great for puppies and any dog that loves to chew, but be careful and watch your pet, as my Jack Russell has gotten this stuck on her teeth and needed help to get it off her tooth! My dog can't stomach raw hide, so we usually give her the sweet potato chews, but decided to try these. She LOVES them! She runs off and sits in her bed a chews away (and she's a pretty aggressive chewer). I'd definitely say they are her new favorite treat. I got these for my smaller dog and he is able to chew them well. I wanted something that he could chew as he has a sensitive mouth. Because he has a heart issue, I limit the type of treats I give him. I do cut this one in 1/2 just so it is easier for him and they last longer. My 10y/o 23lb Rescue Love these peanut butter Smart Sticks. I am not exaggerating,he acts as though he will attack me if I don’t give him a stick. He will not calm down until he gets one. I buy 6 bags at a time so as not to run out. I can’t hide them; he finds them. I got these smart bones for the first time in my last order and gave one to my GSD/Husky mix as soon as they arrived. She LOVED IT and the bag is already gone. Next time I will have to order more. They have then in pet stores but the bag has only 5 sticks at almost double the price!! !